With the county’s favourite Italian extravaganza set to return tomorrow here’s a list of all the fun and festivities in store. Horsham’s Piazza Italia makes it’s grand return for it’s 12th year on Good Friday (March 30) with a whole host of treats including supercar displays, Italian markets and even F1 racing experiences. Despite being cut to two days - Good Friday and Easter Monday - guests will still be able to enjoy lots of family fun in the Carfax, Bishopric, Market Square, East Street and Parkside. - Good Friday sees the return of a massive display of Italian bikes featuring a cross section of Ducati models and many other brands. The bike display will be in East Street from 12.30pm. - The Bullseye Scooter Club will host a display of Italian scooters alongside their friends at The Bear pub in Market Square on Easter Monday from 10am. - There will be lots of indoor activities this year, should the weather not be so kind. On Good Friday and Easter Monday there is slot car racing with Horsham Rotary at the Council’s Parkside building – just £1 a go with circuits for both novice and more confident ‘drivers’. - There will also be three F1 Simulators at Parkside this year. Pirelli have brought their replica F1 car as part of the Kwik Fit Road Safety Zone while Altitude Events have their two simulators inside the Parkside foyer. One on one challenge racing will take place on Good Friday as well as a fastest lap time competition with a very special prize from Premier GT as part of their Race Paddock on Easter Monday. (Both just £2 a go or equivalent donation to Pirelli). - You can listen to the Mad Music Machine by STEAMCademy as it produces tunes using samples of all your favourite supercar sounds. - Not actually part of Piazza Italia, but a fun edition to Easter Saturday, there will be Messy Easter activities for younger children thanks to Horsham Churches Together in Swan Walk near Toy Barnhaus. - There will be Fun Fair rides in the Forum by Bensons on Friday, Saturday and Easter Monday, while visitors will also be able to enjoy free Pizza making with Dominos in the Carfax on Good Friday. - Up at the Parkside offices, there will be face painting and ice cream both days and Jumpin’ Jockeys on Good Friday. Parkside will also offer child’s Go Karts on Easter Monday. - The Springboard Project have Easter Arts and Crafts at Parkside and huge local favourite Tom Foolery will be down in the Carfax between 2 and 4pm on Easter Monday. - Horsham Rotary Easter Bunny Hunt will start on Good Friday and will continue throughout the two week Easter break. - Displays of classic Italian cars including Alfa Romeos, Fiats and Maserati’s will be held throughout the weekend. - Around 53 mini owners have booked to take part in a special Parkside display on Good Friday which serves to promote next year’s triple anniversary (60 years of the Mini, 50 years of the Italian Job film 30 years of the ItalianJob.com charity). - Premier GT’s race paddock at Parkside on Easter Monday promises a special selection of rare RS Fords. - The Sporting Bears club are set to return with ‘Dream Rides’ as it looks to raise funds to be shared amongst this year’s supported children’s charities. Bookings are recommended early on Good Friday and Easter Monday as spaces fill up rapidly. Check out the Sporting Bears cool wall at the Brock Taylor offices - at the corner of East Street and Market Square - to book your ride. - Virtual racing will also be held at Parkside with its three F1 simulators on both days. - The Rotary slot cars at Parkside also offer another opportunity to test those competitive driving skills. - Piazza Italia will host the voices of opera star Jo Appleby, the singing chef Jon Nulty (both in the Carfax on Good Friday) and our very own Gondolier (in the Carfax and around town on Good Friday). - Mr Pavarotti, the Oyster Opera duo and a walkabout Supercar stilt walker join Monday’s bill along with local youngsters Terra Nova and Young HAODS. Children’s favourite Tom Foolery supports the Springboard Project in the Carfax between 2pm and 4pm. - Horsham’s favourite Italian Market, Italia in Piazza returns to Carfax directed by original owner Simon Faro and now in partnership with Horsham’s signature Italian café and Italian food specialist Giovanni’s & Panino. There will be a selection of Italian cheeses, cold meats and specialities with a new selection of regional hot food specialities including Piadina Romagnola, fresh seafood and pizzette from Napoli, Gelateria cannoli and gelato with brioche, Arancini from Sicily, Porchetta Romana from Roma and the all-time Piazza Italia favourite, Italian sausages grilled freshly in a roll with relish. - Sussex Street Food of the Year winner - Garlic Wood Farm - and Pig & Jacket will also be offering food both days. - Wood fired Pizza’s, the Hepworth’s brewery tent and a range of sweeter options from Vice Puddings, Thomas Cookies and more will also be available. - The Italian Market will also feature a range of Italian wines and the Pop- Up Piaggio Prosecco bar returns injecting a little fizz to proceedings. - Children’s charities are once again at the heart of the event with long standing partners Chestnut Tree House Children’s Hospice and The Children’s Trust joined by local inclusive play charity The Springboard Project. 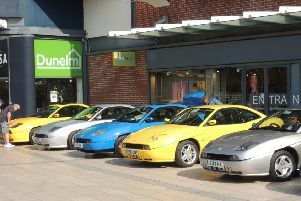 - Charitable partners also include ItalianJob.com, SERV Sussex Blood Transport, and the Rotary Club of Horsham. - On Good Friday HR Owen Lamborghini are looking to present a Lamborghini display. - An impressive display of Abarth’s from the South East Owner’s Club will be parading the famous scorpion badge with pride in the Bishopric on Easter Monday. - The Children’s Trust Supercar Event will also be held in Market Square on Good Friday, while the popular Ferrari display will be in the Bishopric on Friday and the Forum on Easter Monday. - British McLaren’s will pack out East Street on Easter Monday, and Maserati’s will be on display in the Carfax on Good Friday. - On Easter Monday Premier GT will bring a pack of Supercars and race pedigree cars to both the Carfax and Parkside. - There will also be parades through the Carfax as vehicles leave the town at 3.30pm on both days.